For a kids party in Melbourne there are heaps of options and this is regardless of your age or budget. Free entertainment in this city may be wandering around a beach in Altona, a park in Manningham or alternatively a walk on the Frankston pier. Paid entertainment may also vary in type and cost and include many options. Reptile party shows for birthdays is an idea that was derided when invented in the 1970's. The idea that was invented by Australian snake expert Ray Hoser in the 1970s was lampooned at the time as completely crazy. No one ever thought the reptile party idea would ever become a global phenomena like it is today in the post 2000 period. But since the 1970's Hoser has built up a successful business known as Melbourne reptile parties. The concept of an educational party show for kids parties has since been copied by people all over the globe, even though it�s humble beginnings were in Melbourne and Sydney in Australia all those decades ago. In every big cities today you will find someone, somewhere advertising their services to give you or your kids the ultimate reptile party show for birthday entertainment. The reptile party idea is of a snake handler bringing snakes, lizards and crocodiles as well as other kinds of wildlife, now potentially including almost anything, to a venue and letting the kids hold the animals and learn about them at the same time. While this is was and still is the original Hoser concept. It is not been copied by a number of other operators in the wildlife display business. For reasons not entirely certain, no one else in Australia do their copy-cat reptile shows in quite the same way as the Hoser business. Alternative�s to the Hoser theme are kids party events that are in the form of a show and tell, and in some cases the kids are allowed to touch or pat the reptiles. Other less experienced companies do boring static displays, these being a load of animals in cages brought to your home or venue. The boring static displays are regarded as the least intere4sting of all the displays, as the animals are invariably hiding in their cages and there are many other issues associated with them. These include the fact that even if a large number of caged animals are brought to a venue, people can look at them all qwithin a few short minutes and then from then on the entertainment is all over! These less experienced imitators claim that letting wildlife or other animals being held at children�s parties is dangerous and should never be done. However Ray Hoser and his team of experts disagrees and backs his view with an unmatched perfect safety record spanning more than 32 years in the reptile and animal display business. 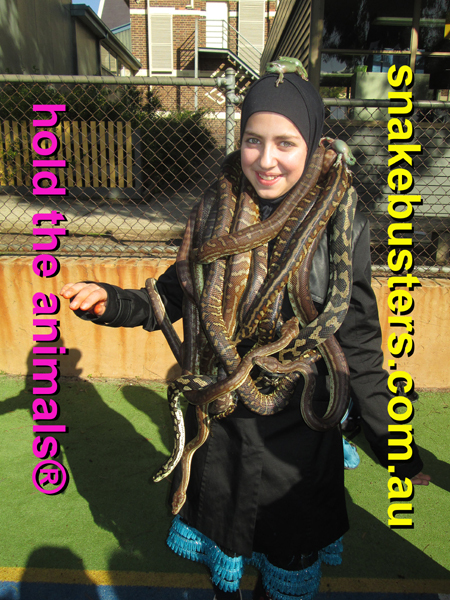 The kids reptile party shows in Melbourne, Victoria, Australia, run by Australia's snake man Ray Hoser can be phoned on this number: 03 98123322. As would be expected, his shows are the most popular and sought after in Australia and although Melbourne-based, he does go everywhere, with cost being the main reason people outside Melbourne may not want to book him. The snake man does get very busy as everyone wants to have the snake man at their venue, so the general advice is to make the booking for the best reptile show party company before you send out your invitations stating the time and date. Oh, and make sure that you have a few cameras and photographers available, as you�d be crazy not to get memories of your very own reptile party as well!